Our family just returned from a fantastically restorative road trip to Terlingua, Texas. Depending on whether you encounter an ice storm in Oklahoma in the middle of the night (as we did on our return trip), the drive from Avon, Ohio is anywhere between 27 hours and 31 hours with plenty of stops for gas, meals, restroom breaks and much-needed stretches. We logged 4,200 miles in two weeks. I’ve been doing this drive since I was eight weeks old when my dad first discovered what’s become my favorite place on earth – Big Bend National Park. This was the first time we made this journey with the kids as two adults and it was very special to me. I can’t wait to get us all back there! After arriving home from this trip (and getting a really good night’s sleep), I started to think about how many miles Mateo’s AAC devices have traveled with him over the years. I have to wonder whether we introduced people on this trip to AAC for the first time. Let me tell you, Terlingua is about as isolated and rural as you can get. It wasn’t that long ago that it boasted a one-room schoolhouse for grades K-8. High school students still travel more than three hours roundtrip each day to get to their classrooms. I have to wonder what special education looks like in Terlingua. As an SLP, I’ve often asked myself whether I have a colleague down there providing speech and language services to children who need them. I sure hope so. 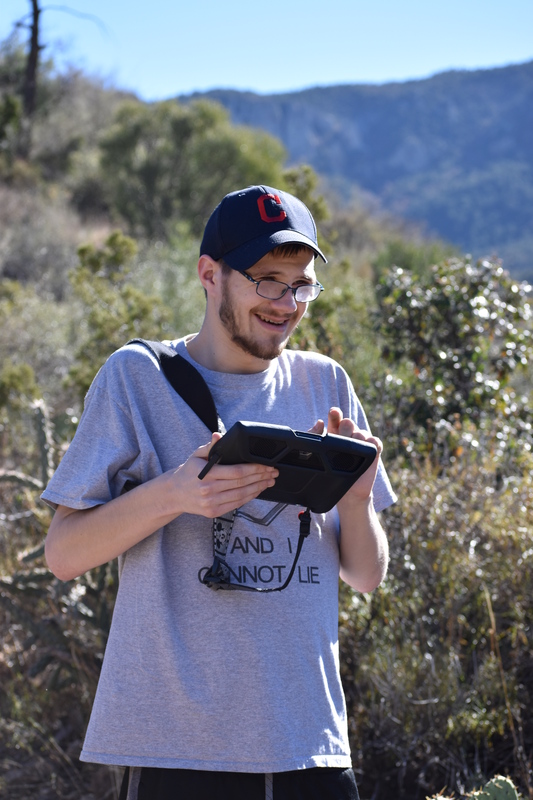 I thought that in this post, I’d share a little about what AAC looks like for us on the road. We’ve always found that road trips are beautifully conducive to great conversation. I think I’ve mentioned this before, but it was imperative early on that Mateo learn to communicate with his device in the car. When we were relying on sign language, I nearly ran off the road DOZENS of times attempting to discern his messages while driving. And let me tell you, that guy is the best co-pilot. Even in the middle of the night, when everyone else is sound asleep, Mateo rarely nods off. He chats up the driver on topics ranging from his football playoff predictions and favorite baseball players to his thoughts on the current president and movie producers. During the night, he dims his Tobii Dynavox screen and lowers the volume so its glow doesn’t distract the driver and he doesn’t wake the rest of the family. 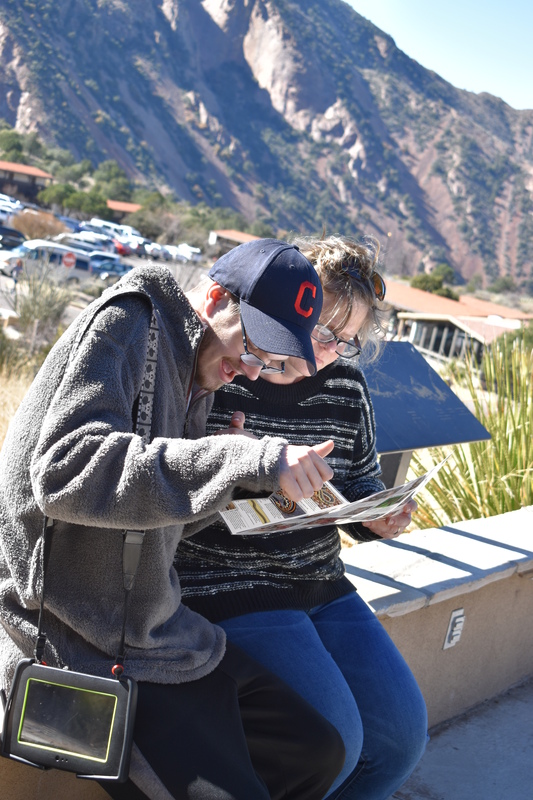 Below are some of the many ways we incorporate AAC into our vacations. We don’t think about any of this anymore, mind you. It’s just living. It’s part of our crazy life. But in those early days, it took a lot of planning and modeling. We make sure that Mateo’s Tobii Dynavox is ready to go by utilizing a converter in the car that allows him to charge the device on long drives. He ALWAYS has his device with him. 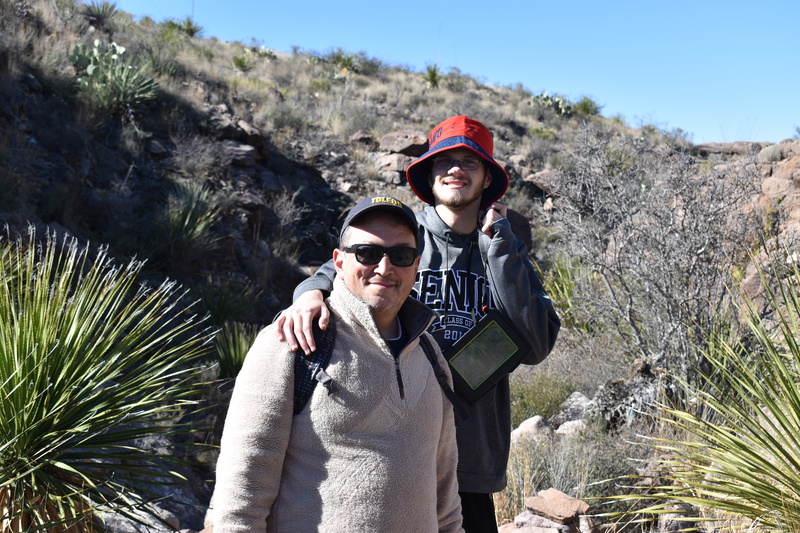 At Big Bend National Park, he hiked rugged trails with his device over his shoulder. He loved introducing himself to the friendly hikers we met along the way. He always has a back-up device at-the-ready. On this trip, this included his iPad with the companion app on it, as well as his iPhone with Assistive Express on it. We always have a fully charged portable iOS charger on hand too – just in case. To some, this might seem a bit overkill, but we don’t like to take any chances. Mateo is very fortunate that he is able to access an array of devices easily and that he is able to choose whatever mode of communication is best for him at that moment. Once we arrive at our hotel room or vacation home, we immediately designate a spot where the devices are charged and ready for use. At restaurants, Mateo asks servers about ingredients due to his food allergies and orders his meals. He asks for directions and help when he needs it. He buys tickets and makes purchases. He never forgets to thank those who provide assistance. As a family, we like to discuss what’s on the itinerary. He talks about his preferences and proposes suggestions on what he’d like to do. He protests when someone suggests something that doesn’t interest him. He negotiates when he thinks a compromise can be met. We enjoy playing board games. Our family is pretty competitive and Mateo is no exception. There is never a shortage of trash talking and cheerleading. We like to travel with games to enjoy in the evenings. At hotels and resorts, we like to look for a library of games that can be borrowed. I Spy – Players try to be the first to locate items belonging to a category – animals, car models, restaurants, license plates, ballparks, and whatever else we find interesting along the way. We’ve also played I Spy to search for items that begin or end certain letters or sounds (i.e. words that begin with /s/ sounds) and to search for items by function (i.e. places you can eat). Madeline: There once was an evil stepsister named Jill. Mateo: She owned a snake. Manuel: She liked to take her snake to school every day. Tina: Her teacher was terrified of snakes. Madeline: During math class, the snake slithered out of the Jill’s lunchbag. Manuel: But there was a boy sitting behind Jill and he did notice. Tina: He just sat there to see what would happen. Mateo likes to know what’s on the route when we’re on road trips and he proposes stops he’d like to make along the way. He enjoys taking in all the billboards and talking about what he sees. He tells us about the ballparks that are in the cities we pass through and their baseball teams’ records. We can easily persuade him to search for information about points of interest along the way and share what he learns. I know I’ve written about this before, but Mateo has never met a stranger and loves to meet new people. He happily introduces himself to other restaurant guests while waiting for tables, for example. He likes to find out where people are from and which sport teams they cheer for. He doesn’t mind stirring things up by starting a conversation about politics or trash talking while watching a football in “enemy territory.” Collectively, the rest of us are introverts, but not Mateo. We’ve met some really interesting people because of him! Mateo has an amazing imagination and an abundance of creativity. On this trip, he began working on a parody of Taylor Swift’s song Welcome to New York entitled Welcome to Big Bend and a poem about snakes. With all the distractions of video games and movies left behind, Mateo had more time to drum up these projects. We look forward to watching these unfold in 2019. Spots are still available for the three-day workshop with Drs. Karen Erickson and David Koppenhaver entitled Comprehensive Literacy Instruction for Students with Significant Disabilities and Complex Communication Needs. This event will be offered in Cleveland, Ohio March 11-13, 2019. This course focuses on conventional literacy instruction for students with moderate to significant disabilities. The presenters will guide participants in learning how to provide daily comprehensive literacy instruction that includes word study, self-directed reading, reading comprehension, and writing. Course participants will examine student work samples, videos of classroom instruction, methods of instruction, and theoretical frameworks supporting universal literacy. The course is open to any and all interested educators and related services personnel concerned with supporting communication and literacy in these students. Parents, consults and administrators are encouraged to attend. Register before January 15th to receive the early-bird discount. This entry was posted in AAC, Education, Inclusion, Language, Literacy, Reading, SLP, Special Education, Writing and tagged AAC, advocacy, Camp ALEC, communication, competence, core vocabulary, David Koppenhaver, Karen Erickson, literacy, nonverbal, reading, schools, SLP, special education, voice, writing. Bookmark the permalink.